The network of federal and state cultural resource regulations can be challenging to navigate. Clients have often asked Terracon to guide them through these regulations and help find the balance between preserving cultural treasures and advancing business needs. Recently, a client proposed to mine approximately 5 million cubic yards of sand from the Yellow House Creek Borrow Site on Daniel Island as part of an expansion project at a Charleston, S.C., port. Terracon was asked by the South Carolina Ports Authority (SCPA) to evaluate the potential impacts on freshwater wetlands during the construction and operation of the sand mine, and to ensure all federal and state compliance requirements were met for project approval. The first project task was to complete Phase II archaeological testing of five of the sites on Yellow House Creek Borrow Site. In accordance with cultural resources regulations, each site that would be impacted by the sand mine had to be evaluated for possible inclusion in the National Register of Historic Places (NRHP). Three sites were recommended as eligible for inclusion based on the evaluations. Following federal and state guidelines, the next task was to perform archaeological data recovery excavations on the three sites to mitigate the adverse effects that could result from the proposed mining operations. Archaeological data recovery requires specific skills, and the Terracon team had the necessary expertise. Based on those skills and the success of the Phase II work, Terracon was selected to conduct the excavations. The team began meticulously hand-excavating the 600 square meters of sediments across the three sites. Using total station surveying equipment, each excavation block and the locations of artifacts were mapped. Based on the field work, Terracon archaeologists discovered evidence of human occupation in the area spanning more than 12,000 years. 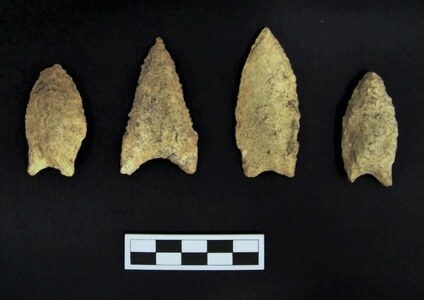 Artifacts recovered data from the Middle/Late Paleoindian through Mississippian periods (12,000–500 years ago) and include stone spear points and arrowheads, prehistoric pottery, baked clay cooking disks and balls, and bone tools. Artifacts, like the baked clay disks and balls, were recovered in numbers rarely seen at other sites. Even the prehistoric pottery, although commonly found, were recovered in vast numbers. This indicates the site was occupied repeatedly and intensively for nearly 12,000 years. Unusual findings included a carved piece of sandstone – the first one found by a Terracon team in South Carolina, after years of archaeology digs in the area. Of particular interest was the discovery of a midden, or garbage deposit, containing discarded bone and shell that can provide insight into the survival practices of the site’s prehistoric occupants. By examining the density and diversity of artifact types at each site, the team derived information about the site’s former inhabitants, such as whether there was a single or repeated occupancy (e.g., seasonal). The team, having only started the analysis, won’t have results for another year. In the end, the project approached $1 million and required a 15-person team to be on site for three months. 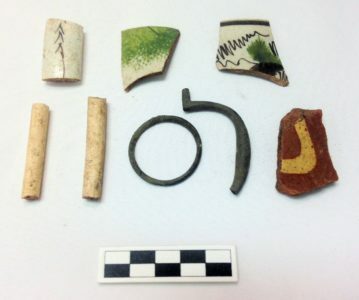 The more than 50,000 artifacts recovered at Yellow House Creek Site will be curated at the South Carolina Institute of Archaeology and Anthropology, University of South Carolina, along with an online digital archive of the site’s contents. Terracon’s work resulted in the client gaining authorization from the appropriate governing agencies to move forward with the project, while ensuring the remarkable relics are preserved for future generations. Bill Green, M.A., RPA, is a group manager in the environmental department of our Columbia, S.C., office. 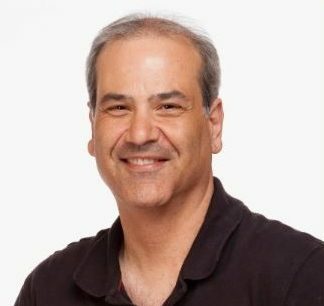 He has more than 26 years of experience conducting cultural resource projects in the eastern U.S. including management and execution of reconnaissance and Phase I surveys, Phase II evaluative testing, and Phase III data recovery projects. To complete this project successfully and on time, support from Terracon employees from offices across the country was essential. In addition, Doug Sain, Ph.D., was the field director and was instrumental in keeping the project on schedule and budget.